In Spain, the Porsche Cayenne has become a symbol of how people lived above what they could afford. MADRID -- Roberto Murga, a construction manager from Barcelona, loved his platinum gray Porsche Cayenne until the debt crisis made the sport-utility vehicle's leather interior and electronic seats expendable. The 66,370-euro ($88,800) status symbol is now unnecessary ballast for Murga, 33, who like other Spaniards has been forced to cut spending because of the country's weakening economy. Car demand, which has halved since peaking in 2007, probably won't recover this decade, analysts predict. "I can't splurge anymore, and maintaining my precious Cayenne is just too expensive," said Murga, who made as much as 8,000 euros a month before the real estate bubble went bust three years ago, forcing him to fire half his workers. "We have no profit at all. We just try to survive." Murga has lots of company. The end of the property and construction boom, fueled by a speculative bubble and low interest rates during the previous decade, caused Spain's unemployment rate to more than double to 22.8 percent. The economy, which stagnated in the third quarter, may contract in the final three months. 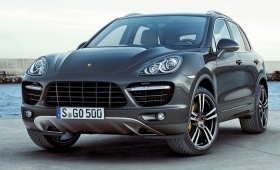 The Cayenne, Porsche SE's best-selling model, has become a symbol of the excess, with the scaling back of expectations dubbed the "Cayenne crisis," said Victor Conde, marketing professor at Madrid's Universidad Nebrija. "This car was the paradigm of how we lived above what we could afford," Conde said. "Banks were giving way too many loans and everybody here was driving a Cayenne." Those days are over and may never be coming back. Porsche sales in Spain and Portugal have fallen 34 percent from the 2007 peak to 1,900 cars last year. Deliveries of BMW's namesake brand have dropped 47 percent to 32,500. It's not just luxury brands that are suffering. Spain's local auto industry, a rare source of manufacturing jobs in an economy dominated by services and tourism, has also been hard hit. That represents a particular challenge for Volkswagen Group's Seat, the only Spain-based carmaker. Overall car sales in Spain will likely total 810,700 vehicles this year, down 51 percent from 2007, when 1.61 million cars were sold in the market. That level won't be reached again this decade, according to Jonathon Poskitt, an analyst with LMC Automotive in Oxford, England. "The real issue is that there appears to be no quick fix on the horizon," said Poskitt. "The euro-zone crisis is hammering confidence in the region, and Spain in particular has a massive problem with the unemployment rate." The European car market has fallen 13 percent over the past four years. Carmakers in Spain are responding by trimming production. Ford Motor Co. will furlough 4,000 workers for 39 days at its assembly plant in Valencia next year. Renault plans to temporarily lay off 2,295 workers at its plant in Valladolid for as many as 29 days in 2012. The French carmaker will also suspend the night shift at its Palencia plant starting in January. The bleak outlook for the Spanish market is pushing Seat and other local auto companies to expand into other markets. The VW unit will start sales in China next year and is broadening its product offering with the new Mii city car.It's also updating its Ibiza and Leon compacts and the Toledo sedan. "Seat has to respond to the challenges of a complicated situation, chiefly in our home market," Paul Sevin, the Spanish brand's sales chief, said in an interview. "Seat's overall performance makes us upbeat and definitely represents an improvement over 2010. Seat's success does not depend on a single market." Seat narrowed its operating loss to 101 million euros in the first nine months of 2011 from 218 million euros a year earlier. Revenue rose 6 percent to 3.96 billion euros. Cie Automotive SA, a car parts supplier based in Bilbao, is also escaping the market's slump by pursuing sales outside Spain, where it generates only about 5 percent of its total revenue. "The market here is broken, but has clearly reached a bottom and should start a recovery during the second half of next year," Chairman Anton Pradera said in an interview. Cie's clients include VW, Renault, Ford and General Motors Co. GM's money-losing Opel unit operates a factory in Zaragoza. Without labor market reforms, the Spanish auto industry could be in for further cuts as growth shifts to Asia making the Spanish plants potentially expendable amid an overcapacity glut in Europe, said Ricardo Mateo, an economics professor at Universidad de Navarra in Pamplona. "Without more flexibility, there's no future for this industry," Mateo said. "Labor costs and taxes in Spain are high, unions very strong, and the industry needs to remain competitive as cars are now also produced in China, Korea, India and South Africa." Customers are adapting to the new reality. Juan Ramon Valdivia, 19, who works at his family's restaurant in Malaga on Spain's southern coast, is looking to unload his Cayenne for a less expensive VW or Peugeot. "I didn't pay much attention to price before, but now I do," said Valdivia, who's adjusting his priorities after revenue at the restaurant declined 30 percent over the past two years. "The Cayenne consumes too much gasoline." While Valdivia and Murga have turned into ready sellers of their Cayennes, the availability of high-end used cars hasn't helped dealers like Angel Rodriguez, sales manager at Arguelles Automoviles in Madrid, who said revenue is down 60 percent from peak times and profit margins have tumbled 50 percent. The Cayenne was the "favorite car for many people, especially in the construction industry," said Rodriguez, who's been selling cars for 30 years. "Later many found out they couldn't afford it, or even pay for it at all, and I see them now driving a Renault."